The Severn Valley Railway ran between Hartlebury and Shrewsbury and the southern section as far as the bridge over Severn below Arley is in Worcestershire. The railway was authorised by the Severn Valley Railway Act that received the Royal Assent on 20th August 1853. This authorised the building a railway from a junction with the OWW south of Hartlebury station and terminating in Shrewsbury. Further Acts were passed in 1855 and. These authorised changes to the line of route and in particular avoided the need for a new station at Hartlebury. The West Midland and Severn Valley Companies Act, 1861 received Royal Assent on 1st August 1861 to authorise construction of a line from a junction with the SVR near to the southern end of Bewdley station to a junction with the WMR near to Kidderminster station. Further Acts in 1864, 1868, 1875 were necessary. Construction of the line from Hartlebury to Shrewsbury commenced in 1859. This included the laying of he foundation stone of the bridge over the Severn on 24th November 1859. This was named 'Victoria Bridge' in honour of the Queen. It was cast and erected by the Coalbrookdale Company. The formal opening took place on 31st January 1862 when a special train ran from Worcester Shrub Hill station. Amongst the guests was Alexander Clunes Sheriff (later of the Worcester Engine Works Company Limited) who was the General Manger of the West Midland Railway. Public services began on 1st February 1862. Construction work on the Kidderminster to Bewdley section started in 1874 and the line opened to the public on 1st June 1878. Hartlebury station was rebuilt around 1865. The bridge over the Kidderminster to Worcester road (A449) was demolished in 1985. About 1¼ miles from Hartlebury, the Regent Oil Co opened a depot on 28th August 1939. It was known as Leapgate Private Sidings and the connection trailed in from the left. There were two sidings on either side of a gantry and these could accommodate up to 17 20-ton wagons. After the cutting there was a sand quarry that was served by a siding about ¾ mile south of Stourport signal box. After the quarry closed the siding was used to store coal wagons waiting for entry to Stourport power station. The construction of Stourport Power Station was authorised in 1918. The railway connection was built in 1940. There was a nest of eight sidings. A bridge over Worcester Road was dismantled on 4th February 1986. BR worked coal to the power station until March 1979. The track was lifted in 1983. Stourport Station was renamed Stourport-on-Severn in October 1934. Burlish Halt had one platform on the right. Sidings on the left with a junction facing Stourport served the works of Steatite & Porcelain Products Ltd opened in 1929. Initially this was via a crossing over the Stourport to Bewdley road but this was closed in 1935 although the sidings remained in use. On the loop to Kidderminster a new locomotive depot was erected in 1932 just beyond Hoo Road overbridge. The depot closed in 1964. Sidings were laid in 1925 to serve the Sugar Factory and were used until 1980. Foley Park Halt was opened on 2nd January 1905. Originally on the south side of the line but moved to the north side when the sidings were laid to the sugar factory. It remained in use until the line closed on 6th January 1970. After Bewdley Tunnel (480 yards long) was Rifle Range Halt that opened in June 1905. The next station on the line is at Bewdley. The Tenbury line diverges about a mile north of Bewdley station. Northwood Halt was opened on 17th June 1935. Just to the north of here the Elan Valley aqueduct is carried over the Severn. A contractors' siding was installed by the GWR on the left hand side of the line and known as 'Folly Point Siding'. This was completed on 16th September 1899 and removed on completion of the aqueduct in 1906. The railway then crosses the Severn on Victoria Bridge. It was extensively repaired by the SVR in September 1979. This work was completed in time for re-opening on 1st March 1980. As the reminder of the line north of here is not in Worcestershire no notes are provided. This timetable shows that passenger train service as it was in 1958/9. The Shrewsbury to Bewdley section closed to passenger on Saturday 7th September 1963. Through goods traffic ended on 30th November 1963. All that now remained was a passenger service between Kidderminster, Bewdley and Hartlebury as well as coal traffic to Stourport Power Station and from Alveley colliery. The coal traffic from Alveley colliery ended shortly after the mine closed on 31st January 1969. 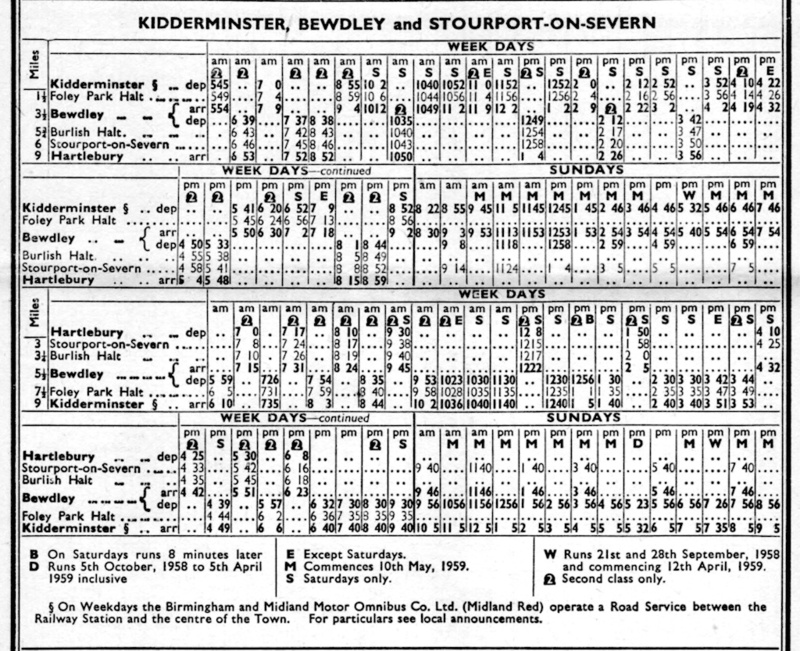 The remaining passenger trains from Bewdley were withdrawn from 5th January 1970. Stourport power station coal traffic ceased in March 1979 and the line was disused from this date. The power station closed soon afterwards. On the Bewdley to Kidderminster loop line BR continued to serve the sugar factory at Foley Park until 1980. The efforts to preserve the line had started by 1965. On 3rd February 1966 BR sold the line from Bridgnorth to Hampton Loade to the newly formed preservation society. The first locomotive No.3205 arrived on 25th March 1967. Bewdley to Foley Park was open on 'gala days' only from 25th March 1977. Bewdley to Kidderminster opened on 30th July 1984. There is a new station at Kidderminster Town on the site of the former goods depot. Bewdley was the start of the Tenbury & Bewdley Railway (Wyre Forest line or Woofferton branch) to Tenbury Wells. This line straddled the border of Worcestershire and Shropshire. This line closed to passengers on 1st August 1962 and for freight on 6th January 1964. There were intermediate stations at Wyre Forest, Cleobury Mortimer (Shropshire), Neon Sollars, Newnham Bridge, Tenbury Wells (Shropshire) (originally Tenbury), Easton Court and Woofferton. Reference: The Severn Valley Railway Guide publised by the company - first edition September 1968.